COSMIC RAYS ARE NEARING A SPACE AGE HIGH: Ten years ago, NASA reported a "perfect storm of cosmic rays." During the year 2009, radiation peppering Earth from deep space reached a 50-year high, registering levels never before seen during the Space Age. It's about to happen again. What's going on? The answer is "Solar Minimum." During the low phase of the 11-year solar cycle, the sun's magnetic field and solar wind weaken. Cosmic rays find it easier to penetrate the inner solar system. In 2009, the sun experienced the deepest solar minimum in a century. 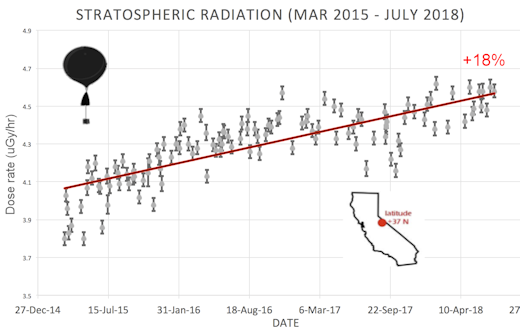 Cosmic rays reaching Earth naturally surged. Ten years later, solar minimum is back with renewed weakening of the sun's magnetic field and the solar wind. Again, it's a "perfect storm." A panel of experts led by NOAA and NASA recently predicted that the current minimum would reach a nadir in late 2019 or 2020, likely matching the record-setting minimum of 2009. 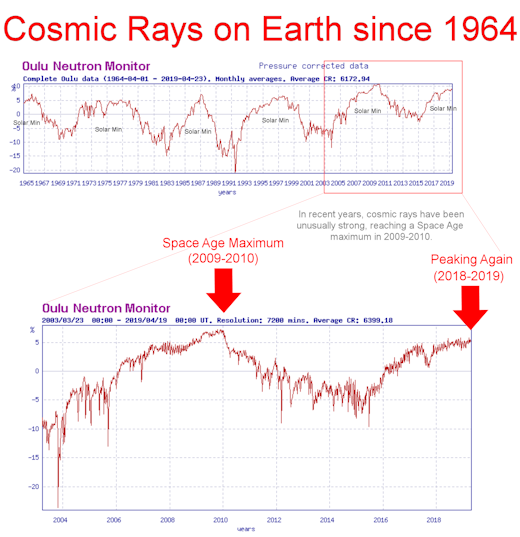 If they're right, cosmic rays will continue to increase, with a new record possible in the near future. Every item in the Earth to Sky Store has flown to the edge of space and comes with a greeting card showing the item in flight. The interior of the card tells the story of the gift's journey from launch to landing. 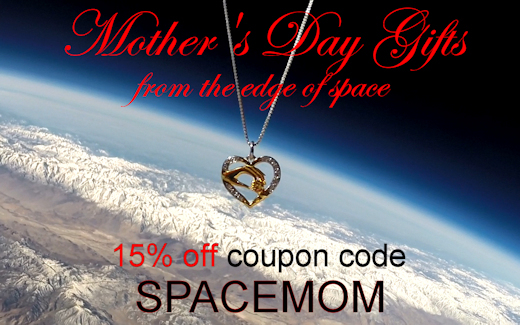 Mom-satisfaction guaranteed! COSMIC RAYS, CONTINUED... Cosmic rays cause "air showers" of secondary particles when they hit Earth's atmosphere. Indeed, this is what neutron monitors and cosmic ray balloons are measuring--the secondary spray of cosmic rays that rains down on Earth. This spray is of special interest to air travelers. 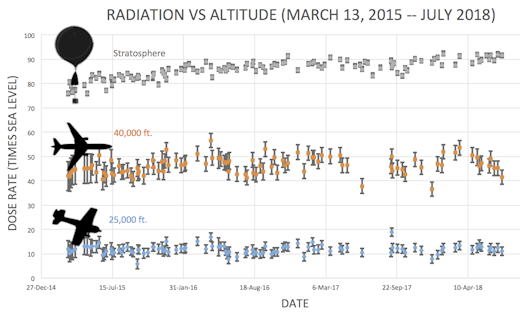 Secondary cosmic rays penetrate the hulls of commercial aircraft, dosing passengers with the whole body equivalent of a dental X-ray even on ordinary mid-latitude flights across the USA. International travelers receive even greater doses. 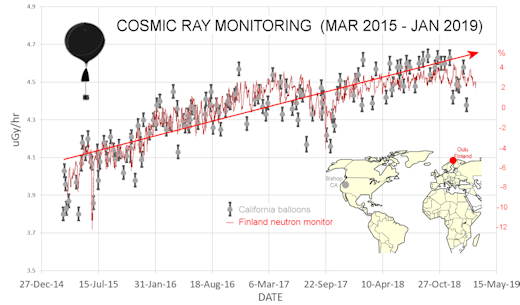 Above: Four years of overlapping data from neutron monitors and cosmic ray balloons. 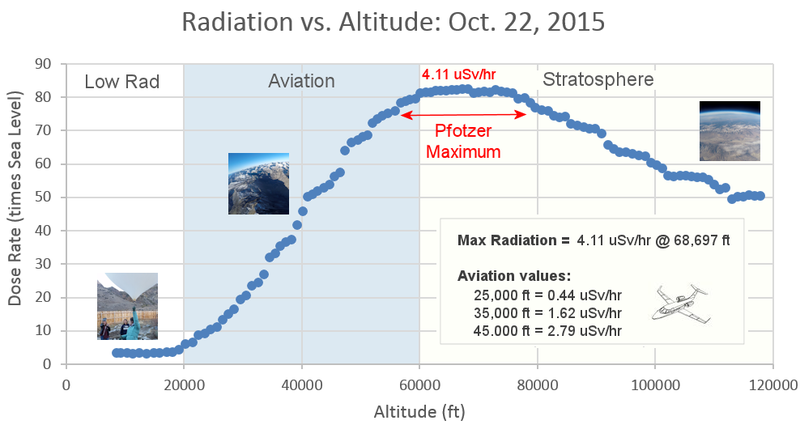 The International Commission on Radiological Protection has classified pilots as occupational radiation workers because of accumulated cosmic ray doses they receive while flying. Moreover, a recent study by researchers at the Harvard School of Public Health shows that flight attendants face an elevated risk of cancer compared to members of the general population. 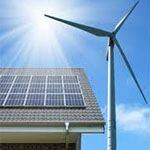 They listed cosmic rays as one of several risk factors. 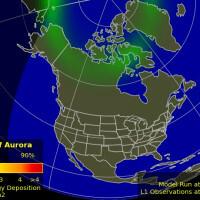 Stay tuned for updates as solar minimum deepens. On Apr. 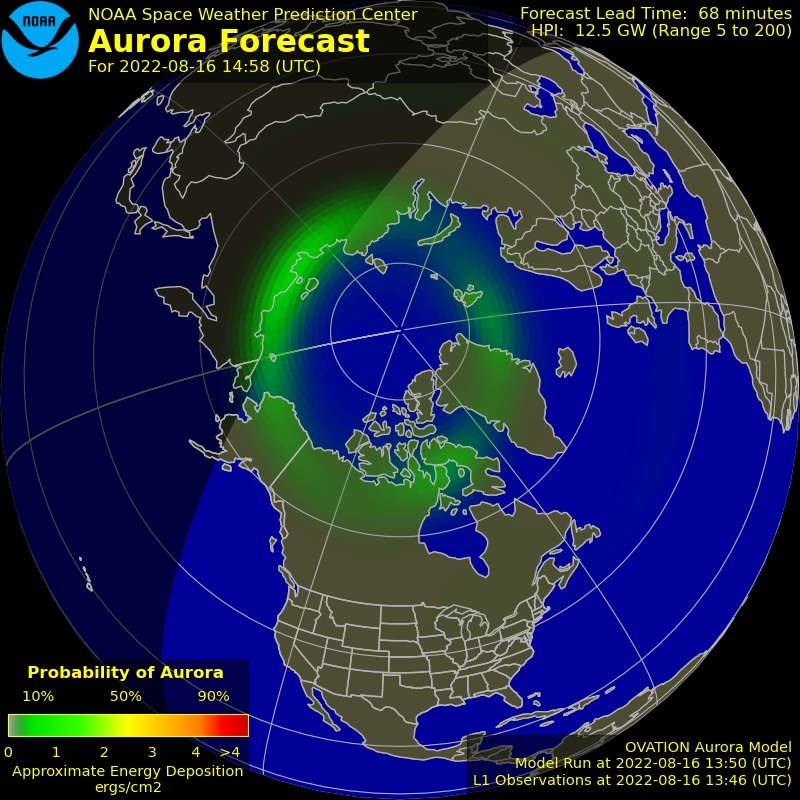 24, 2019, the network reported 32 fireballs. On April 25, 2019 there were 1967 potentially hazardous asteroids.